There's this world, you see. And in this world there are queens. Three queens. Or potential queens. Or something, I was a little confused. And these three queens are actually triplets...sisters, who, at a young age, were separated to be cared for by power hungry individuals tasked with helping each develop a set of skills - one would become a poisoner, one a naturalist, and one an elemental. From there we hop between each girl for some character development before they come of age and must battle to the death, because we all know there can only be one queen. I'm lukewarm about this one. Blake's first series, Anna Dressed in Blood, was full of action and mystery. 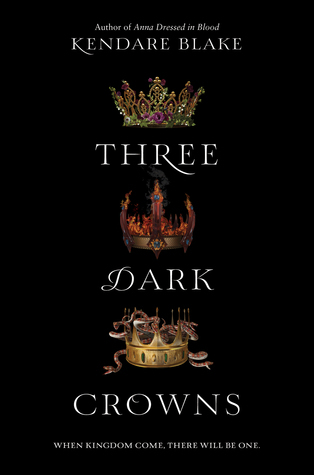 She started running with the plot almost immediately in Anna, and I had hoped for the same with Three Dark Crowns, but I felt like I slogged through 95% of this book. I commented a few times to my reading buddy over at Book Plots & Polka Dots that I was bored to tears. And then, by-golly, the story went and got interesting in the last chapter. Typical. Kind of made me mad, to be honest. I had every intention of leaving the story behind, but now I might have to read the sequel to find out what happens. There was a need for immense world building which sets the slow pace almost immediately. Coupled with the continual bouncing back and forth between characters, and it's easy to get lost. It also struggles with character development because there are SO many people to keep track of, and those people have strange names. Sometimes all of that is easier to keep organized in your noggin when you have the book in hand, but I was listening to the audiobook where every name started to sound the same, leading to the aforementioned confusion. I was never able to connect with any of the "heroines" or even begin to take sides. I'm not sure Blake wants you to take sides, but that seems to be an important part of my reading personality. I need someone to really like and cheer for and preferably someone to kind of hate (and sometimes secretly cheer for). It is different. And if you an stick around until the last fourth of the book, there's a good chance you'll get hooked. Now here's hoping I remember enough when the sequel comes around so that I don't have to re-read!